I don’t usually wear nail polish. I actually don’t own any nail polish before this. I don’t really like how it feels on my fingernails, if that makes sense… Though I do like seeing it on other people’s nails. And it’s sparkly, and comes with built‐in brushes! It’s the best craft material ever. So! 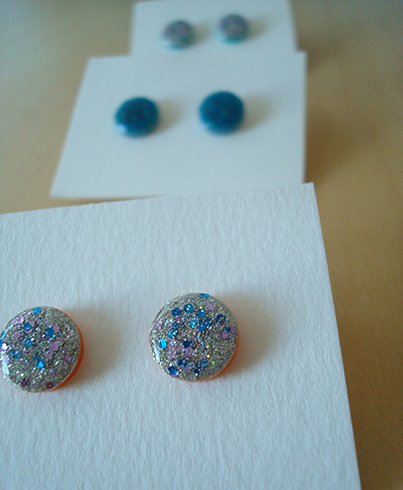 I had an idea to turn some humble buttons into sparkly earrings with nail polish. And it worked! 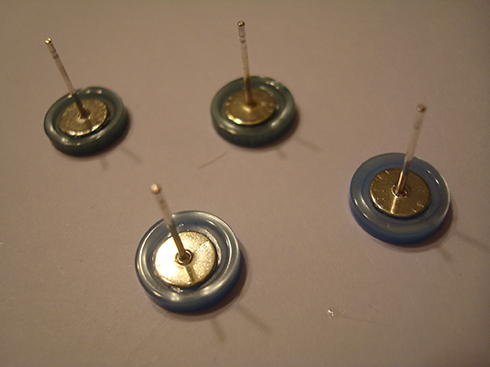 Glue earring posts on buttons with E6000. Let it dry/cure overnight. 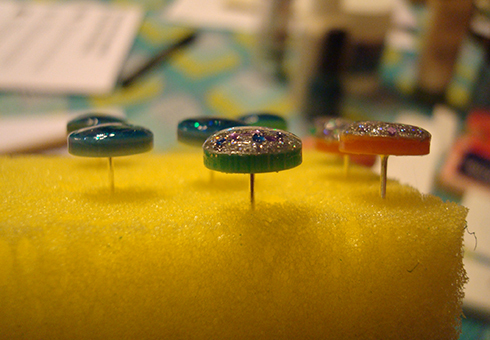 Stick the earrings on a piece of foam (I used a new kitchen sponge). Paint on first coat with opaque colour. Carefully put on a good, thick layer without it spilling over the edge. 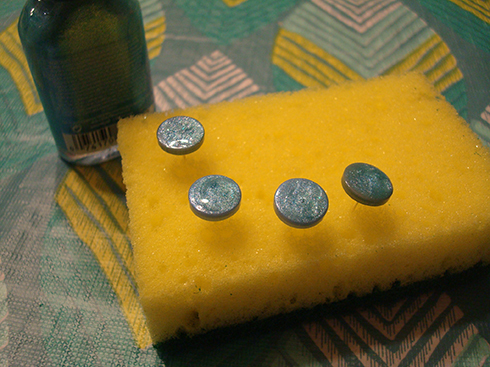 The nail polish will sink into the button holes and dents will appear, so just put on more thick coats after the each coat is dry to the touch (about half an hour), until the dents disappear. 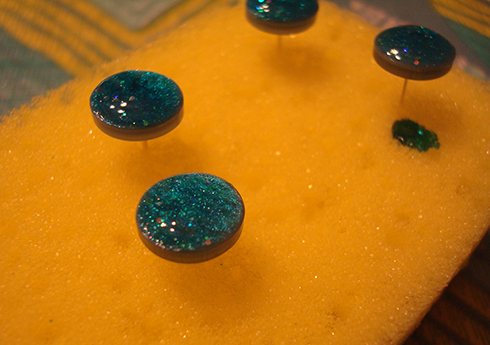 I finished off by painting a thin coat of gloss acrylic varnish around the sides of the buttons and a little over the top, just in case the nail polish peels off the buttons, like it would on fingernails… but I don’t actually think it would peel off with such thick layers of polish. But just in case. Simple, right? 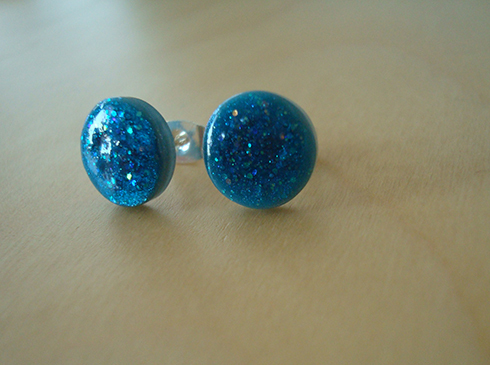 And wouldn’t it look awesome with different shapes buttons, and different colours of glittery nail polish? 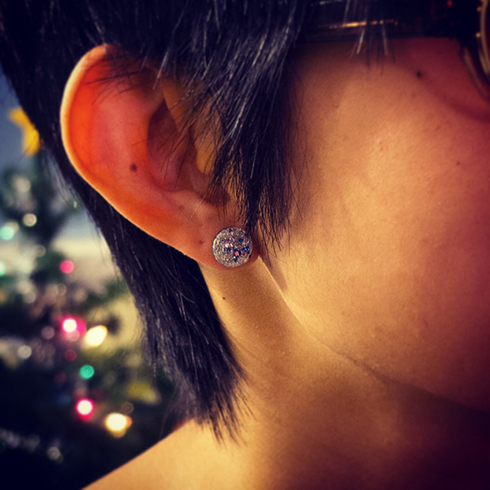 I’ve seen some that comes with star‐shaped glitters! If you do give it a try, I would love to hear how it goes! Very pretty. I love the step‐by‐step instructions and the excellent photos. These would make excellent presents to have on hand all year. thank you, pam! i’m glad you like the tutorial! These are so cute! And so simple! Would it be OK with you if I made some to sell? I would give the idea credit to you. Thanks Emilee! I’m glad you like them. Yes you can sell them as long as you credit this blog. Thanks for checking! Happy crafting! Just wanted to let you know that I made some of these earrings! They turned out really nice. Thanks for the tutorial!